← "Rights ripe for the picking"
WCCNY's Wins "Joe Hill" Award at Tompkins County Labor Day Picnic! This past Labor Day weekend, Workers’ Center of CNY participated in two great Labor Day events. On Sunday, WCCNY worker-leaders Crispin and Saul along with organizers Fabiola, Rebecca, and Nikeeta participated in Labor in the Pulpit at All Saints Church and Grace Episcopal Church. At Grace Episcopal Church, Saul told his story about organizing for health and safety and against retaliation and abuse at Marks Farm, he invited the church to support the Green Light NY: Driving Together/Luz Verde NY: Manejando Juntos and he and Rebecca collected signatures for the Green Light/Luz Verde petition and donations. Grace Episcopal church goer signing the Green Light/Luz Verde petition. At All Saints Church, Crispin also told his story about the Marks Farm organizing and explained why it’s important for our community to support the Green Light NY: Driving Together/Luz Verde NY: Manejando Juntos campaign to expand access to driver’s licenses for immigrants. The congregants were extremely warm, receptive, and supportive of our work and on-going campaigns. We collected 30 signatures for the Green Light petition and All Saints signed on in support of the campaign as an organization. Crispin addressing congregation of All Saints with Fabiola interpreting. We want to thank Rector Johanna Marcure and the congregants at Grace Episcopal Church and Father Frederick Daley, Meg Ksander, and all of the parishioners at All Saints Church for their support, time, and donations. Also a special thanks to Joseph Paparone from the Labor Religion Coalition of New York State for connecting us with All Saints Church. On Labor Day, WCCNY members, volunteers, and organizers went to the Tompkins County Workers’ Center Midstate Central Labor Council’s 33rd annual Labor Day Picnic where WCCNY and Worker Justice Center (WJC) farmworker members were honored with the Joe Hill for our on going farmworker organizing. WCCNY members Damien, Pascual, Andres, Jacqueline, and volunteer Chris all did an amazing job representing the organization! 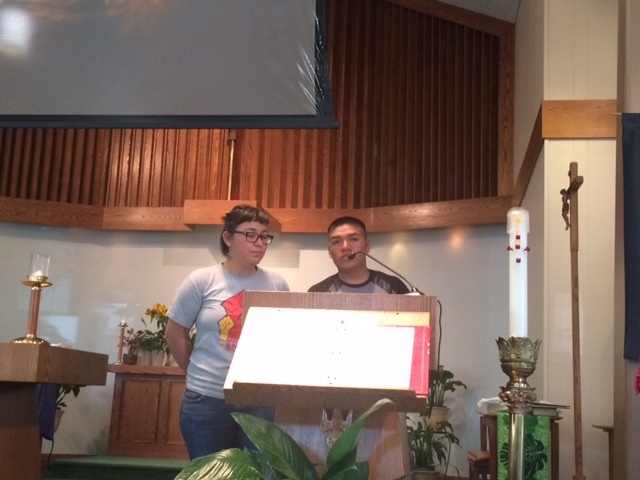 Pascual and Damien read the statements on behalf of Crispin and Antonio sharing their stories not just about the unjust working conditions on farms but the importance of collectively standing up to these injustices. Chris and Jacqueline did an awesome job of working the table at the event! They helped to collect over 80 signatures for the Green Light/Luz Verde petition, sold WCCNY t-shirts, buttons, and other merchandise, and met a lot of great new people interested in our organization and work. We want to thank the Tompkins County Workers’ Center and the Midstate Central Labor Council for recognizing the important work that WCCNY and WJC farmworker members have been doing in the fight for the dignity and justice for farmworkers. And of course we are extremely proud of and grateful for our WCCNY members who continue to tirelessly work to build and grow the organization and keep fighting for justice!